I spent four hours at the mall with both kids one day last week so I could tackle some of my Christmas shopping. Four hours at the mall at Christmas time is bad enough, so I'm sure you can imagine how it was with a baby and three year old in a double wide stroller (which I love, for the record). The stroller baskets were packed to the gills with snacks, toys to keep Spencer occupied, diapers & wipes, changes of clothing and on top of each hood I loaded our coats, shopping bags and an odd assortment of clothing items that Eloise insisted on peeling off. By hour three the kids were slightly cranky but I was so close to done that we had to push on. By hour four I was the cranky one and ready to go. But then Eloise noticed Santa, who we had walked past several times already, and insisted it was time to go see him. I had planned to take Eloise and Spencer to see Santa, just not this day. I wanted them to be dressed in Christmas outfits, or at least have on clean clothing and clean faces, but opportunity knocked and Eloise decided that the time for Santa was now. I gave both kids a baby wipe wash, smoothed Spencer's hair, fixed Eloise's headband and that was that. But, you know what, their Santa photo is absolutely perfect. 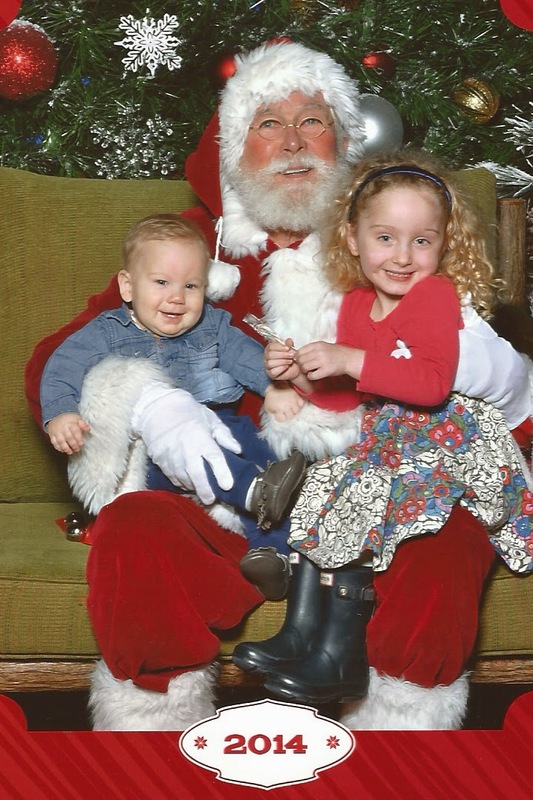 Eloise was so excited to tell Santa her Christmas wish and introduce her little brother, and their faces say it all.